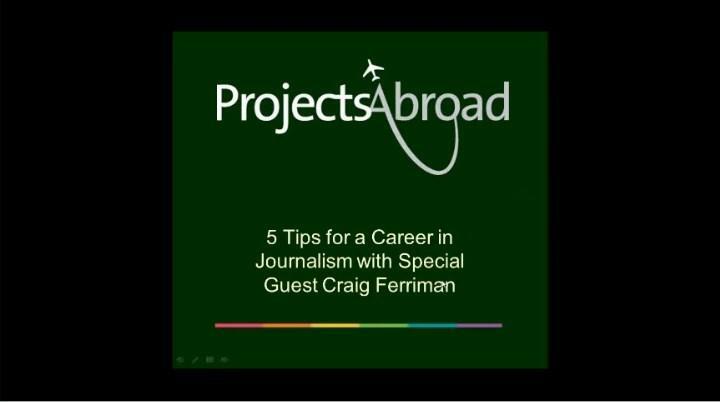 Last night I held a webinar with Craig Ferriman on his 5 tips on how to become a journalist. Craig is the Assistant News Editor at Channel 4 News, but more importantly he is a former Projects Abroad volunteer! It’s always great to see how our volunteers develop after our projects and all the different careers they go into. Craig started out as a volunteer on our print journalism project in Cape Town. He’s since got work experience on TV and radio and still presents a show on Brighton’s Coastway Radio station. Craig gave some fantastic advice about how to get into journalism. He freely admits that it’s not the easiest industry in the world to get into, but with a lot of perseverance and focusing your energy in the right places, it can be done. In preparation for the webinar Craig interviewed Mail Online columnist Rik Sharma and Heart Sussex newsreader Marcella Whittingdale to get their thoughts on becoming a journalist. He played clips from their interviews during the webinar to give an alternative perspective. I hope you find it useful. If you have a question for Craig or want to start a debate on the issues raised then leave a comment in the box below. For anyone with a particular interest in investigative journalism, it would also be worth checking out this recent podcast from journalism.co.uk which has some really good advice. Feel free to let me know if you think we need to add anything to this list of tips or if there are other good resources we should be making people aware of.